Los Angeles is a glorious metropolitan city in California. It’s the USA’s hub for TV and movies, and is therefore unsurprisingly awash with celebrities. Even if you don’t spot them in real life, walking along the Avenue of stars, where the famous literally have stars laid for them in the footpath, is a pretty awesome experience, especially at night. Then there’s Beverly Hills, home to the rich. The iconic Hollywood sign looms impressively over the city of Angels. But it’s not all about celebrities. There are plenty of American cultural sights, thrilling activities and educational attractions in the evening. Los Angeles is famous worldwide, a city of glitz and glam and filled with fun activities. Here are our recommendations for the 29 most fun things to do in LA at night. 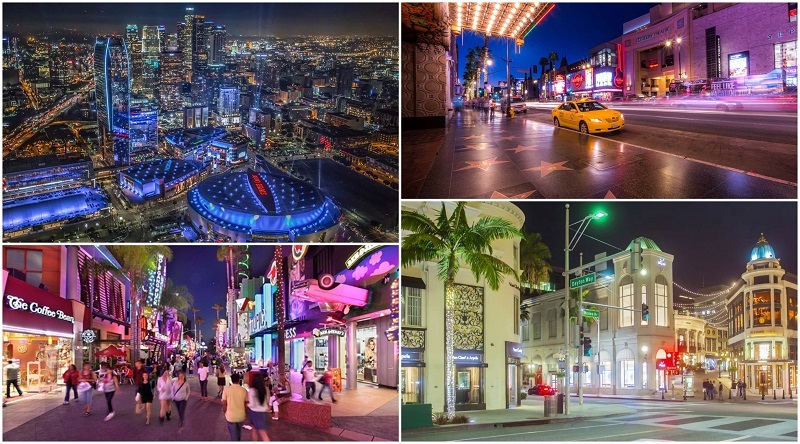 Immerse yourself in LA’s night time glitz and glam by seeing the city all lit up. This 4 hour long tour passes all of the major attractions. See the iconic Hollywood sign illuminated at night and the panoramic cityscape. Absorb the atmosphere of mystery and romance as you tour downtown LA. All the while you get brilliant views and photo opportunities of sights such as the Disney Concert Hall and the Staples Center. 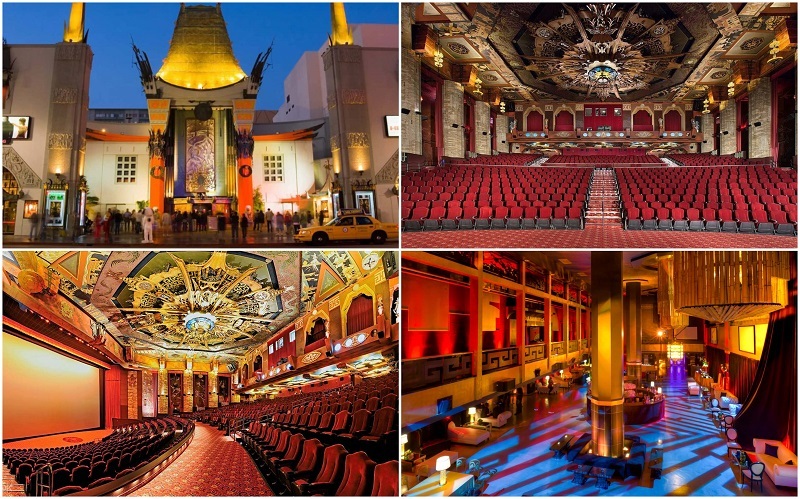 This tour is made for those who love the glitz and glam of old style Hollywood. If you are a fan of silver screen legends such as Marilyn Munro and Charlie Chaplin, this tour is for you. Visit vintage pubs and learn about the speakeasies and celebrity parties of Hollywood past. Enjoy old fashioned glam and gossip as your guide regales you with anecdotes from the past. Your guide can also recommend other great spots to continue your pub tour afterwards, avoiding the crowded tourist hot spots and drinking with locals. Discover all the secrets of the rich and famous as you tour their neighborhood, Beverly Hills. Learn who lived and died in which houses, as well as who was arrested and what for. Michael Jackson, Whitney Houston, Marilyn Monroe and Hugh Grant are just some of the celebrities your guide will tell you about. Some of the main points of interest include Sunset Strip, the Beverly Hills Hotel and the Golden Triangle. 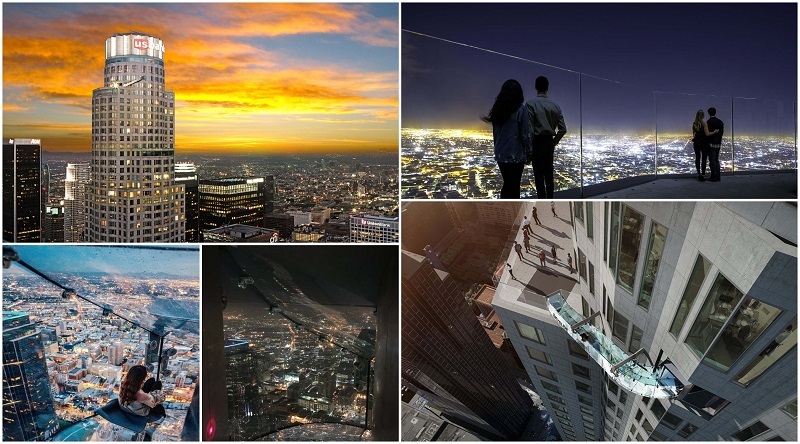 1000 ft above downtown LA, the Skyspace experience is not one to be missed. Relax on the highest open air sun terraces in LA. Enjoy 360 panoramic views of the city, including the iconic Hollywood sign. The Skyspace Journey Theater has excellent footage of how the city has evolved. You can even pose on the red carpet and create your own graffiti art. Brave the Skyslide if you dare! At 1000ft high the 45ft fully enclosed glass slide is bound to get your heart racing. OUE Skyspace is open daily 10am-10pm with the last admission at 9pm. 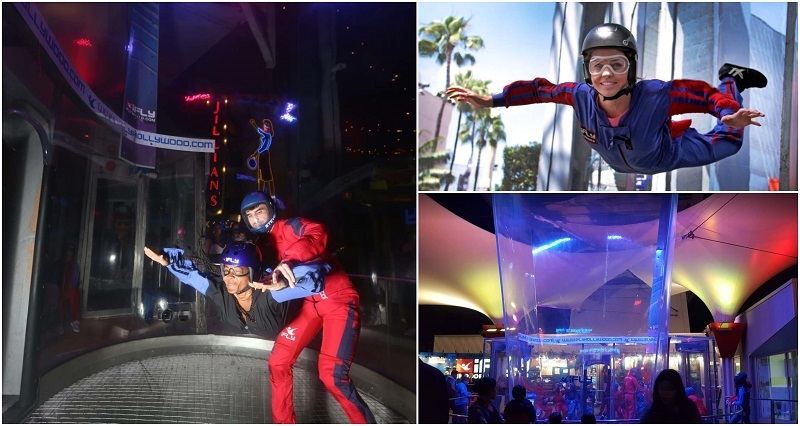 Experience what it would be like to glide with an indoor skydiving experience. You will experience wind speeds of up to 175mph (282kph) as you float in a purpose built wind tunnel used by professional skydivers. You are guaranteed to be buzzing from all that adrenaline! The venue is opened until 8pm Monday to Sunday and 9pm Friday to Saturday. A city as vibrant as Los Angeles, with its star studded history, gangs and ghettos is not short of ghost stories. If you love getting spooked, or want a tour with a gory twist, this is the tour for you. 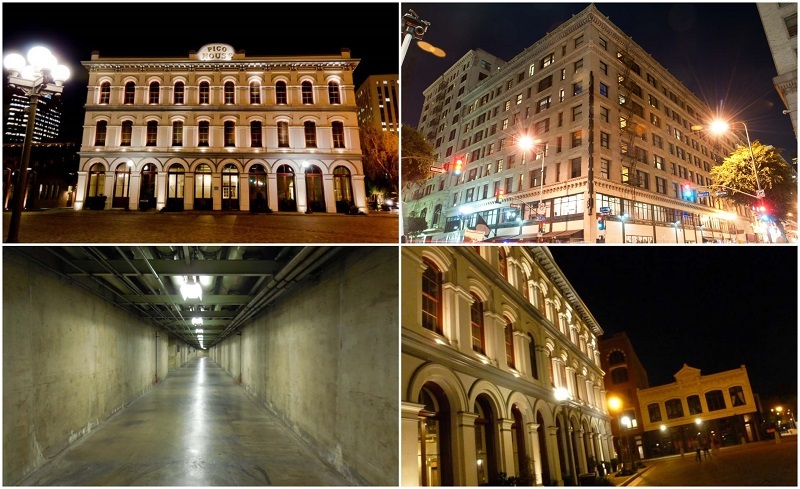 Walk through LA’s spookiest streets as your guide regales you with terrifying tales. Unsolved murders, ghostly footsteps and cries of massacred Chinese immigrants could all be heard. Learn about the bomb that levelled LA as you walk through pedestrian tunnels beneath the civic building. In Addition, discover the facts of the infamous unsolved murder case of Elizabeth Short ‘The Black Dahlia’ in 1947. The tour starts at 6:30pm. 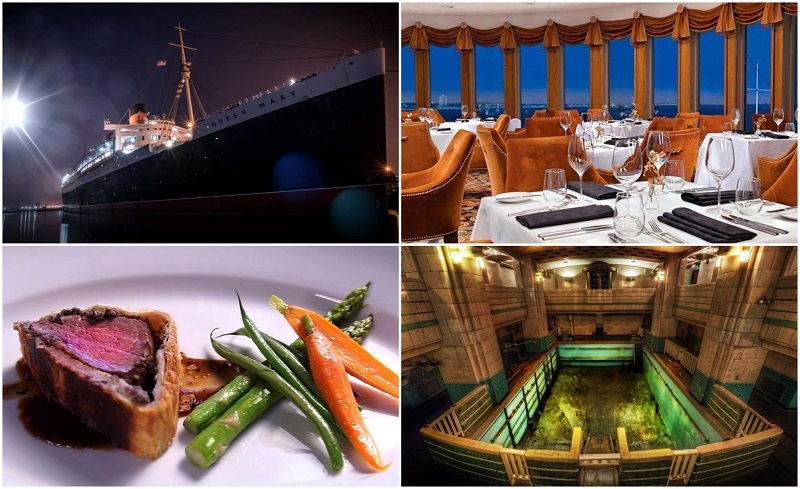 The Queen Mary is a 1930s transatlantic Ocean Liner and nowadays a floating museum dedicated to its life at sea. Aboard you will learn secrets of celebrity passengers and alleged spirits that haunt the decks today. There are 4 tours available; depending on how many of the exhibits you wish to see. The Grand Voyage passport is the ticket to everything, from the 4D Theatre screening included on all tours to the Ghosts and legends Tour and Queen Mary Historical Exhibits. Exhibits close at 6pm, as fine dining and paranormal tours begin in the evening. Perhaps you wish to wine and dine with your loved one, or are looking for a night of elegance and fun. Maybe you just want to dine somewhere a bit different. Enjoy on a delicious 4 course meal on this LA cruise. A complimentary welcome glass of champagne is provided to all, and you can upgrade to window seating and a champagne meal. Following the freshly prepared food dance the night away to the onboard DJ or admire the views of LA at night. Los Angeles is a stunning sprawling city, so what better way to experience it’s size than from the air. A night aerial view or sunset tour is extra special, showcasing LA both at day and night when it’s lit up spectacularly. A romantic treat or a novel way to see the city, it’s definitely worth the expense. You can choose aerial views from a helicopter or airplane, and head along the coast, downtown LA or the hollywood sign depending on what appeals to you most. 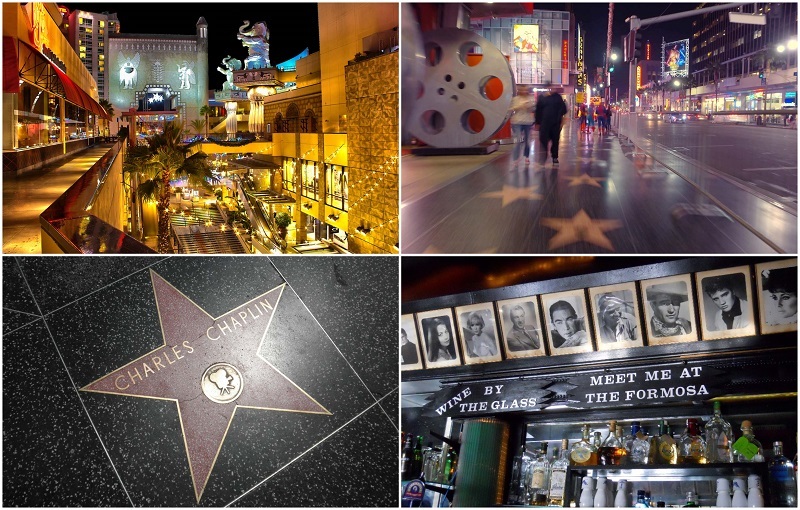 LA is synonymous with Hollywood and celebrities, so why not go celebrity spotting where your’e certain to catch some? Madame Tussauds Wax figurines are intricately detailed life sized replicas, so real you would almost believe you were rubbing shoulders with the stars. Stroll down the red carpet and get photographed with celebrities. Sports stars such as Tiger Woods are posing on the green, and even Spiderman can be seen crawling along the ceiling. With over 100 recreations including Brad Pitt, Jennifer Lopez, Will Smith and Britney Spears you will be sure to make your friends envious. Madame Tussauds is generally open until 8pm daily. One of the most popular of 32 Ripley’s Believe it or not Museums across the world, a visit is sure to impress. Bizare birth defects, revelries of strange occurrences and odd facts will make you wonder if they are true or not. The 300 exhibits include a vampire killing kit, a portrait of Michael Jackson made entirely from candy, and a two headed cow. It certainly gives strength to the saying ‘truth is stranger than fiction’. 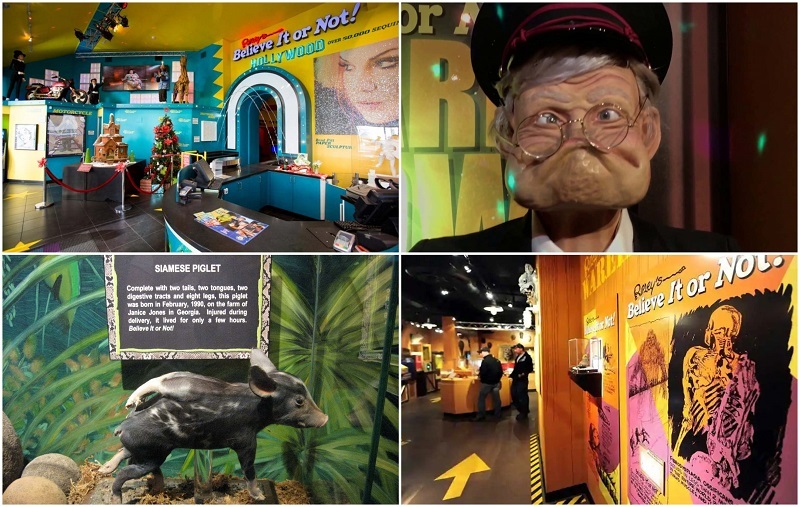 Ripley’s Believe it or not Museum is open daily from 10am until midnight. 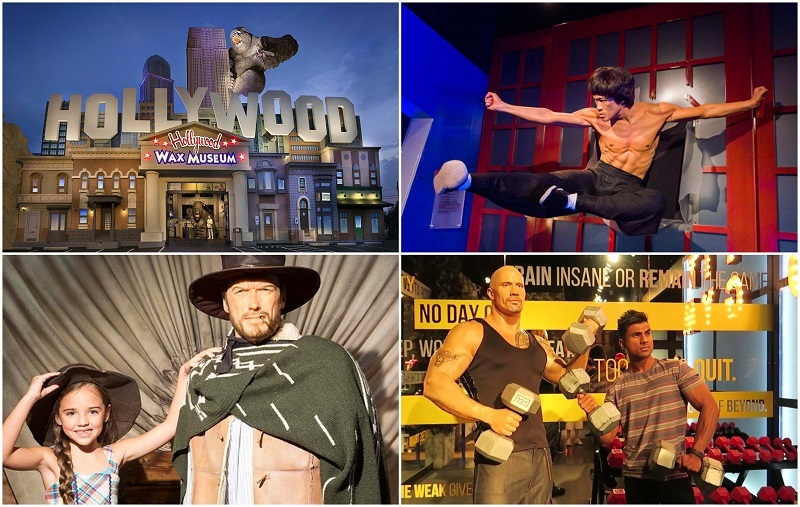 Pose with the stars at the world famous Hollywood Wax Museum. Since 1965 this sight has entertained the masses, making it the most visited attraction on Hollywood Boulevard. Props and accessories are provided so you can have heaps of fun posing with wax likenesses of the famous. All of this comes while learning more about them, including their pets, side businesses, charity work and more. The Wax Museum is open from 9am-midnight Sunday to Thursday and 9am-1am Friday to Saturday. Ever wondered just how tall the worlds tallest man was, or the most hamburgers eaten in 3 minutes? Look no further than the Guinness World Records Museum to discover the strangest and most interesting world records brought to life. Its perfect entertainment for all the family. Records exhibited are from all categories, including pop culture, nature, sport and even space. 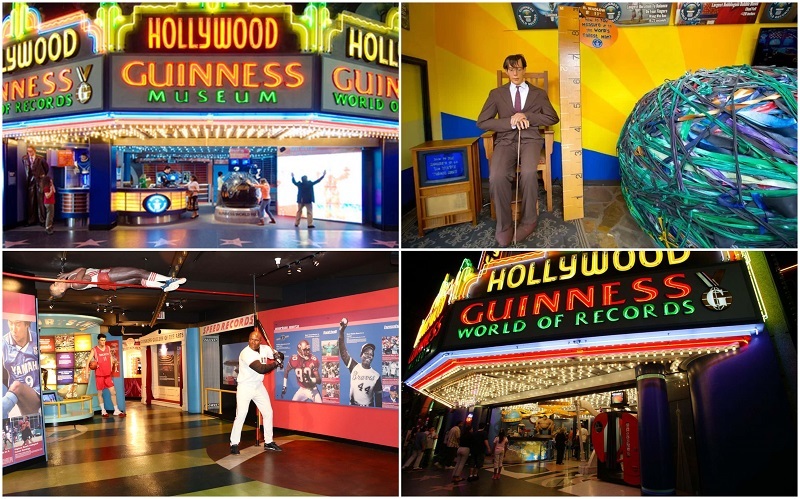 The Guinness World Records Museum is open daily til Midnight. On Fridays and Saturdays, they’re open til 1am. 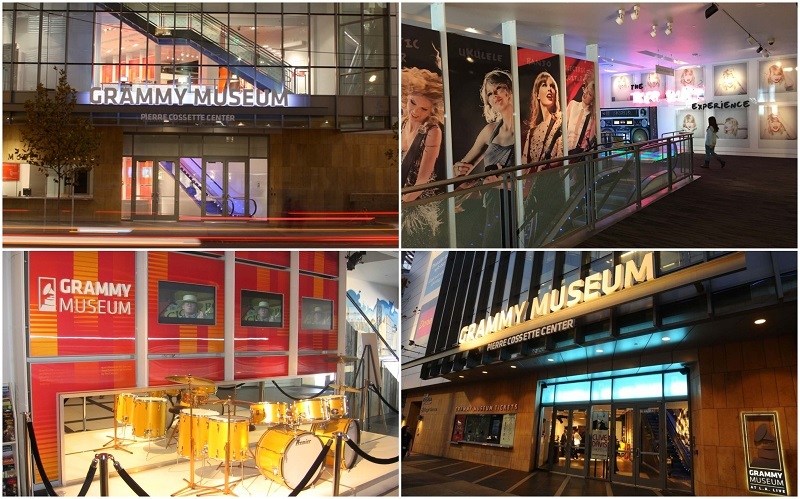 The Grammy Museum is easily the largest music themed museum in Los Angeles. It was opened in 2008 to mark 50 years of Grammy awards and is a must see for music lovers. With both permanent and temporary visits, there is something for everyone, weather you are a fan of pop, rock, hip hop, or anything in-between. See outfits worn by past Grammy winners such as Beyoncé. You can even record and mix your own song! Best time to go to the Grammy Museum at night is Friday or Saturday when they open until 8pm. The Griffith Observatory is a gateway to the stars (this time not the celebrity type). 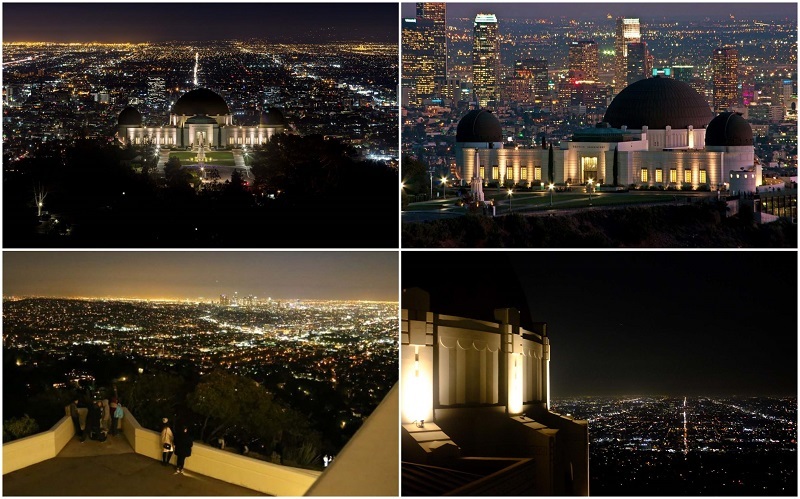 Enjoy a romantic or relaxing sunset tour and hike through Griffith park to the observatory. Check out the night sky through huge telescopes, explore the exhibits, and if you time it right you can enjoy one of their free events. Discover the night skies of California and enjoy a starlight escape from LA’s buzzing nightlife. All great cities have fabulous shopping opportunities and LA is no exception. 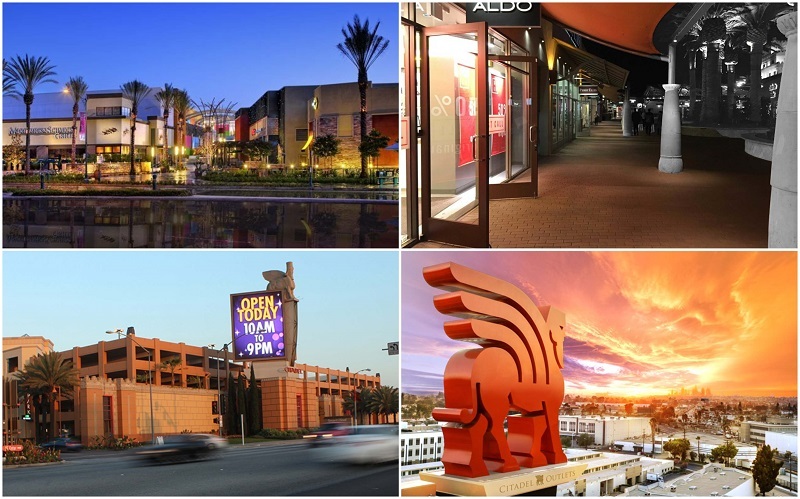 The Citadel Outlet houses 115 stores including famous brand names Calvin Klein and Banana Republic. Shopaholics will love spending their time browsing for a bargain and splurging on fabulous items to take back home. The perfect place to pick up a wardrobe worthy of a celebrity. There’s plenty of restaurants and cafes too, so you can keep refreshed and replenish your energy while you shop. Citadel Outlet is opened daily from 10am to 9pm. 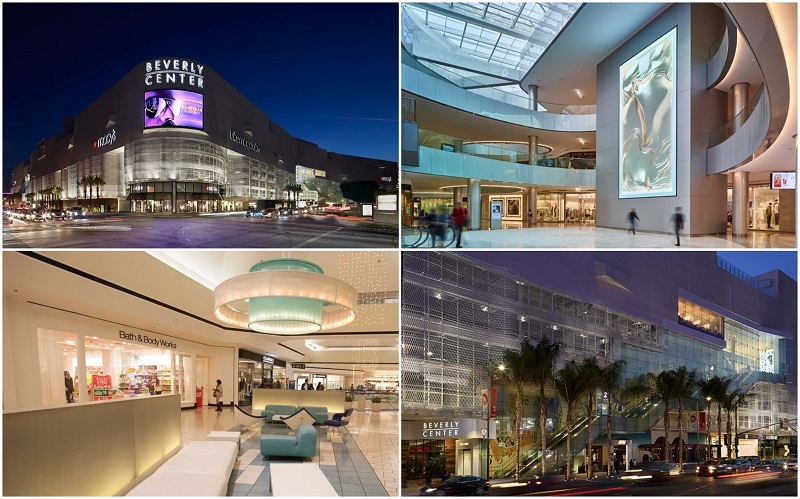 The Beverly Hills Shopping Centre has 100 shops on offer, ranging from chain shops to high end. There is something for everyone’s wallets. The 8 story shopping mall first opened in 1982 on the site of what was previously a local amusement park. Perhaps bizarrely, it still encompasses a working oil field. Considered an eye sore by Los Angeles locals, it’s worth a visit to make your own mind up. The Beverly Center opens til 9pm on weekdays. On Saturday, it’s opened til 8pm and Sunday til 6pm. The prestigious Dolby Theatre is home to the Academy Awards. Renowned for elegance and celebrity glamour, a visit will leave you feeling like a star. Book a show and see a top performer such as Celine Dion or Alicia Keys, who have previously sung here. 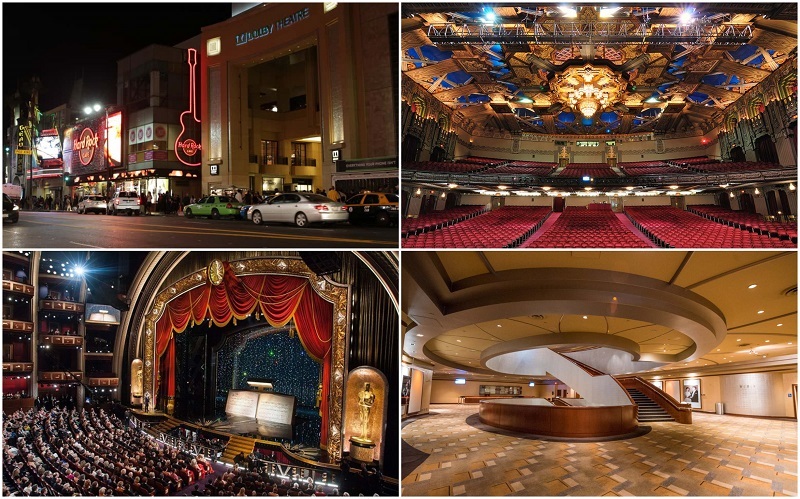 The Dolby Theatre hosts many other events such as Americas got talent, the daytime Emmy Awards, and American Idol Finals. Take a step away from the stage and explore the backstage areas to discover more about this iconic theatre. Since 1927 the impressive TCL Chinease Theatre has been the sight of red carpet movie premiers and star studded special events. Step back in time to the glitz and glamour of Hollywood. Marvel at fabulous costumes, props and artwork associated with its history. Learn fun facts and secrets about cement hand and footprints of famous icons, including Shirley Temple and Marilyn Munroe. 30 minute tours are ongoing from 10:15 am to 7:45 pm. 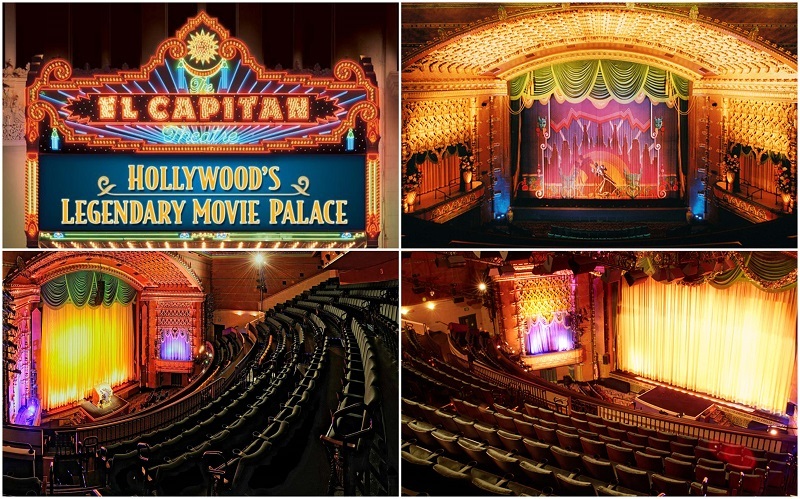 El Captain theatre was restored to its original Spanish colonial architecture by Disney in 1991. It is ornate and glamorous and definitely worth a visit for both movie and Disney fans. There is a changing exhibit showcasing artwork, props and information about the latest Disney movies. Nowadays the theatre itself is only used for premiers and special runs of Disney Movies. Don’t miss out on a chance to experience a show at the theatre. Mix your own delicious cocktails at a Mixology class. Aided by a master cocktail mixologist learn all the secrets and details of mastering the art to mixing the perfect drink. Learn how to stock a basic bar and create classic cocktails. No detail is left untouched as you try out different garnishes so your cocktails looks stunning too. Dance the night away and mingle with the locals as you spend a night experiencing LA’s best clubbing hotspots. Party like a star with VIP entry to 4 fantastic venues, offering you special treatment including party games, drink deals and express entry. Get the party started with your host for the night as you discover the best nightclubs LA has to offer. The nightclub crawls are on Friday and Saturday nights, starting at 8:30pm. Little Tokyo is a commercial district packed with Japanese food stalls, restaurants, stalls and paraphernalia. If you love all things Japanese then this is a must see at night. One of only 3 historic Japanese areas in the United States, there is plenty to offer visitors. Home of the first California Roll and the oldest food purveyor in LA, 130 years of American/Japanese History can be discovered here. Most restaurants are closed late so it’s a great area to grab a late bite. You can’t buy fresher food than whats on offer at a farmers market. From everyday produce, to unusual and even quirky foodstuffs, the LA farmers market is the place to go. Whether it’s groceries or a meal the market caters for all. First opened in 1934, it has grown from a dozen farmers carts to over 100 shops and restaurants. The CBS Television building next door no doubt helps its success. Maybe you’ll bump into a TV personality during your visit. The Farmers Market is opened til 9pm weekdays, 8pm on Saturday and 7pm on Sunday. 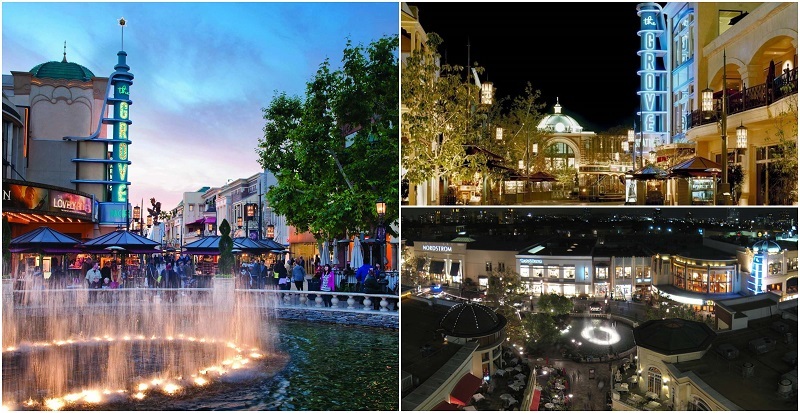 The Grove is 57000 square feet of art deco architecture; a mini city within a city solely for shopping, dining and entertaining. Wander past independent shopping boutiques and restaurants on the stone paved streets of the outdoor mall. If you’re lucky you might even come across a TV Production as the tabloid show Extra is filmed here. 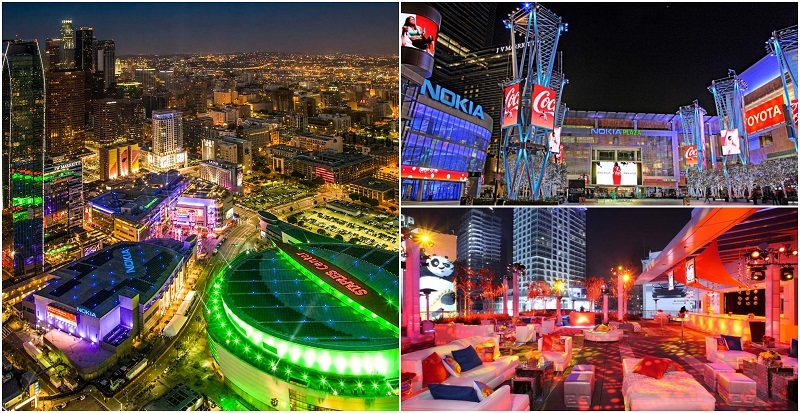 Downtown LA’s entertainment hub, L.A. Live is the heart of the action. The collection of restaurants, bars, and clubs showcase sports, music and movies so there is something for everyone. Thrive on the hustle and bustle as the area comes alive at night. The Conga Room, Nokia Centre and GRAMMY Museum are just some of the iconic attractions to be found amongst exciting and luxurious entertainment venues. 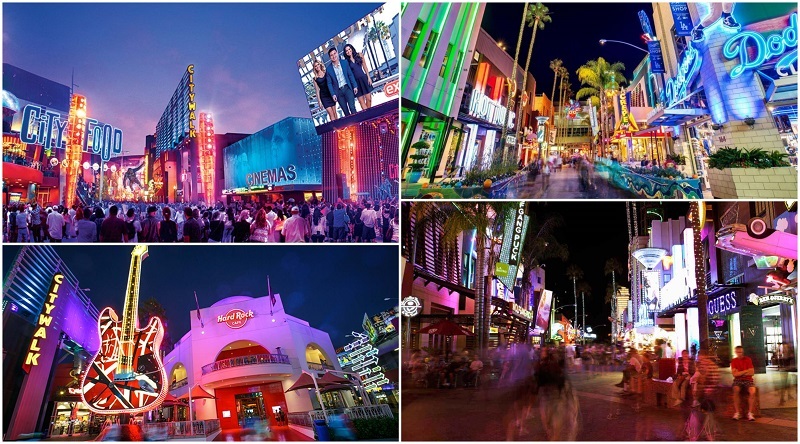 Universal City Walk is a 3 block long commercial fantasy promenade. It is difficult to know where to start, with brand stores such as Billabong and Abercrombie & Fitch lining the streets. In addition are highly reputed restaurants such as the Hard Rock cafe. NASCAR Virtual racing will appeal to fans of Motorsport and cars alike. The 3D IMAX theatre or 18 screen CityWalk Cinema will give you a huge choice of movies. Universal CityWalk is generally buzzing most night, opening till 11pm from Thursday to Sunday, with Monday opening til Midnight. On Tuesdays, it closes at 10pm and on Wednesday, it closes earlier at 7pm. 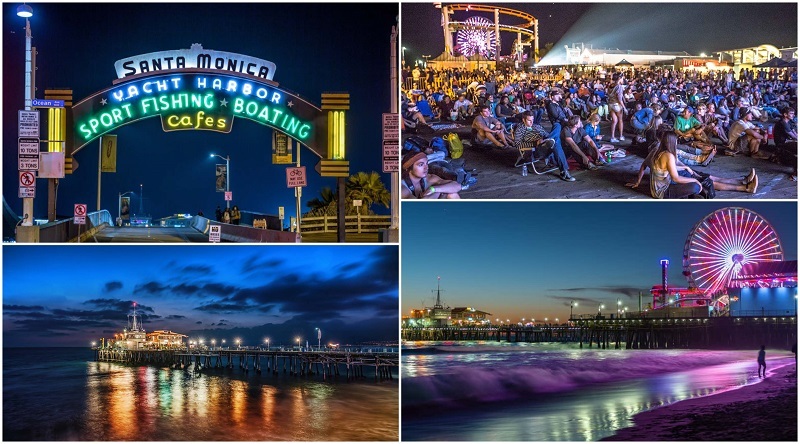 Santa Monica Beach and Pier is a great place families and kids to have a whole lot of fun. Sunbathing aside, the pacific park is full of kid friendly rides. Stroll along past entertainers, snack shacks and anglers. Step back in time for a spin on the vintage merry-go-round. Alternatively hit the games arcade for modern day technology. Soak up the sun, sea breeze and atmosphere at whatever pace you wish. Opening hours of various attractions vary, but do generally open in the evening until at least 7pm. On weekends, they may open til midnight. LA is a truly magical city. A city where some dreams come true, of Hollywood, celebrities, fame and glamour. A city full of secrets and scandals to discover. A city of oddments and the unusual. A city alive at night, when brightly lit streets and venues and attractions jostle for your awe and await your pleasure. It is a city where dreamers can go and experience magic, get a glimpse at fame and fortune, and feel immersed in its bustling, metropolitan culture. With so many options, this list of 28 amazing things to do at night is just the beginning of your adventure in Los Angeles. I lived in LA for 2 years and I enjoyed it. The city has a lot of different and fun things to do. I’ll have to disagree on the Hollywood walk of fame one though. I don’t think its fun to be there at night as the area gets a little bit sketchy. I’ve never tried the Los Angeles Deluxe tour. Im guessing the price is very expensive. One thing that I think this article should include is the price list. Los Angeles is an interesting city. On one side, it is a big city with A LOT of things to see and do. But on the other side, the city is crowded and a little bit dirty. Hollywood boulevard at night is pretty fun. The museums, restaurants, and other attractions. But there are also people who’ll go up in your space trying to ask for money.